Cold capturing my brain for the past few days. Which is why I try to get a bit ahead on certain threads here. But when a blank (not dissimilar to a description of aforesaid "brain") occurs then go to the web and post a couple links. Tom McCahill from Mechanix Illustrated looks at NASCAR in 1951. And Drag Fink takes care of my love of silly, over the top, artwork. Heck, Daytona is coming up. So is the Winternationals. Is Spring far away? Will my cold ever end? 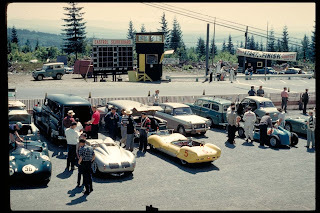 A July 1966 Inter-City modified meet at Nanaimo's Grandview Bowl. The Cal Arnold bio comes from a Grandview Bowl program of that year out of the Don Bennett collection. 1926 is interesting in that southern California racers came north. Ascot Speedway in the Los Angeles was in a bit of a doldrums phase before the local legion took it over. So they headed north on a barnstorming tour. Francis Quinn and Jimmy Sharpe both were to stars but, unfortunately, both lost their lives, Sharpe in a racing accident and Quinn in a road accident. The first of a couple parts. Some more photos, all off my crappy little digital. A better camera would get you better photos. You should go and have a look! A few photos from the Deeley Motorcycle Exhibition show on British motorcycles. The display is on now and will last through 2009. The exhibition is located at 1875 Boundary Road, Vancouver, BC. Hours are M-F 10 am-5 pm, Sa 9:30 am-4:30 pm, Su 11 am-4:30 pm. 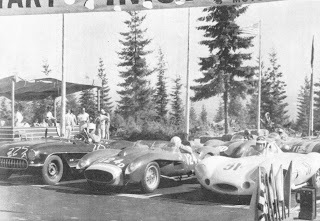 Another Inter-City modified meet at Nanaimo's Grandview Bowl in 1966. Another year of racing at Hastings Park. I believe A.D. Smith is Devon Smith and George Smyth was better known as Swede Smith. Lots of guys named Smith raced back then. This summer Westwood will celebrate its 50th anniversary at Mission Raceway Park. Events will be held July 16-18. Check the Westwood50 website for more information. Just some photos; most, if not all, from Tom Johnston. More photos to come in the ensuing weeks and months. Haven't gone to the microfilm much lately. Holidays and trying to catch up with all the loose pieces of papers stacked up around here. May 22 and 24, 1915 -- Motorcycle races at The Willows in Victoria. Vancouver riders including professionals "Sandy" Bennett, Alan Ross, George McEwan, Fred Bell, C.H. Edwards and amateurs Rayner, Kenneth Craig, Pat Pettipiece, Bob McEwan and W. Olson. Olson was said to be the present holder of the B.C. 5-mile championship. Will have to get the Victoria newspapers out for further details. June 12, 1915 -- First automobile race of the year at Seattle's Madison Park. Some drivers scheduled to race were Joe Thomas, Rae Lentz and Charles Latta. Eddie Pullen, of the Mercer racing team, was supposed to officiate as starter. No results found but worth digging for. I want more motorcycle stuff in here on a regular basis. All that needs to be done is for me to get down and get with it (to borrow from Slade). Here's an old Road and Motorsport in BC feature on the Royal City Rockets motorcycle club. The third race (two races were held on the May long weekend), and Al Smith gets his third main in a row. Langley drivers throughout the standings and finishes. Some interesting names: Jack Smith of Victoria, Happy Horstman (I believe that's the proper spelling), Jack Ross and a guy with a Hispano Suiza. Had an email awhile ago about Jim Grant. Here's a fairly recent story on him. Pike Green, like Don Radbruch, was a great source of information and encouragement for me to continue to research racing history around the Greater Vancouver area. So, like with Don, I have to thank him and can only wish he was still around. Fortunately he still is in his writings. He sent me many photocopies of stories wrote for Racing Wheels in the early 1970s on racers he knew from his years in the northwest, starting with Langford Speedway in the 1930s. He also started Golden Wheels, a fraternity of racers that helps keep the history alive with vintage racing exhibitions. This story is on Swede Lindskog. 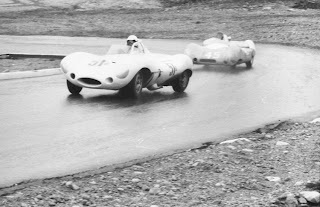 The links up on the sidebar show The Swede Lindskog Project, a nephew of the late racer who is compiling material on the man. One thing I found, and pointed out to Pike, was that Swede did lose a feature (or two) at Langford Speedway. I hate having to "set the record straight". In 1966 the BCTRA at Langley Speedway, and VITRA at Western Speedway, had problems. 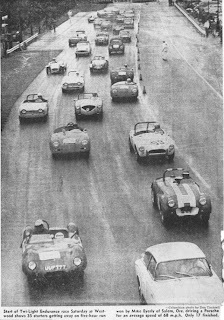 Some of that has been chronicled at the start of the 1966 Langley series on this blog. So where did the BCTRA and VITRA modifieds go? Nanaimo's Grandview Bowl, that's where. To sort out that year of the Inter-city modified series I managed to get over to Nanaimo and look at the 1966 newspaper. Tragedy finally struck the local scene when Dudley Lamberton Smith died as the result of injuries suffered in an accident at Hastings Park, August 18, 1923. The result was to limit the entry of racers to only so-called "professionals" from the U.S. When I spoke with Gordon Reelie many years ago he said that he was at Hastings Park when Smith was killed. At that time Reelie lived in North Burnaby, within hearing distance of the horse track, especially if there were cars racing. The incident ultimately didn't deter him from getting involved with the sport. And, in one of those eerie coincidences, I bought a paperback book called "The Complete Book of Auto Racing" by Lyle Kenyon Engel and the staff of Auto Racing Magazine. "My first contact with car racing -- when working at 'Standard Motors' -- Ford -- 8th and Kingsway. A mechanic 'Dud' Smith -- killed at Hastings Park -- 1923 -- driving a Model T Ford -- with Rajah head -- went thru outside board fence at full speed." "Drove this track several years later in a touring Ford and was chased off by speed cop Charles Palmer -- 'for my own protection'." It's just over a year ago that the inspiration for this blog passed away. Don Radbruch was a fan, a racer, a historian, a writer, and a friend. He is missed by many.